Remember the days before BBC iPlayer when the only chance to watch a great programme you missed was if you or a friend happened to set the VCR? Or the days before BBC News Online when you had to wait for the next scheduled bulletin to get your BBC take on what was going on locally, nationally and globally? The BBC has been at the forefront of digital innovation for the past 20 years, combining our editorial and digital expertise to help change how, when and where we read stories, listen to programmes or catch up on our favourite shows. Just as we did with BBC News online, iPlayer and the first digital Olympics, we are transforming the BBC online – this time to focus on you. Internally, we’ve been calling this initiative “myBBC”. I’m Phil Fearnley, and as the person responsible for leading this exciting venture, I wanted to provide some more details and give you a sense of what we will be doing in the coming months. Audiences have always been at the heart of what we do, but we want to put you in the driving seat of your BBC experience. Today we have announced the first steps on this path. We will make the BBC online feel personal and relevant to you, by linking up our content and launching new features and functionality to help serve each and every one of you better. You’ll be able to create a BBC experience that you control, recognises you as an individual, and brings you the best of our content based on what we know you’ll love. We’ll make sure you never miss anything important. We will notify you when new series arrive, matches start, interviews are aired, road traffic builds up, news breaks or suggest a dinner recipe on the way home. We will bring together and remember your favourite programmes, interests, journalists, artists, DJs and sports teams, all in one place. We’ll make sure the BBC is available wherever you are. If you have more than one device, our programmes and services will be accessible across all of them, so you can start on your smartphone or tablet, and pick up where you left off on your laptop. And this autumn, we will launch a new personalised app that aims to ensure we bring you something brilliant from the BBC every time you open it up. Finally, we’ll be asking you to join in. Whether it’s knowing what’s topical or trending that week, giving you the tools to let you share or recommend, or letting us know what you think, you’ll be able to participate and make your voice heard across more of our programming. Some of this is already in place across the BBC, online. For example, the BBC Weather app automatically finds your location and gives you weather updates for wherever you are. 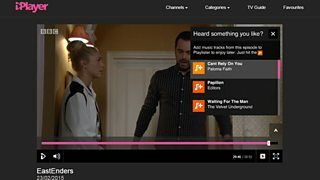 BBC Playlister lets you discover, save and play your favourite music from across the BBC’s programmes or recommended by our DJs, actors and expert curators – across the BBC’s music and radio websites and apps, and now in iPlayer too. 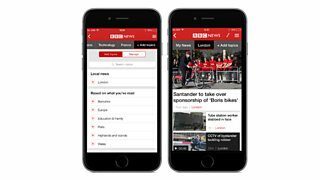 The new BBC News app launched in January, and its myNews feature is a great example of how we can increasingly tailor our online services to you and your interests. 1.6 million people personalised the BBC News app since launch. Soon, the myNews stream will roll out across all platforms, along with election news, weather and travel that’s local and relevant to you. BBC Sport already alerts you to your team’s scores, but starting with the new football season this autumn, we will bring you personalised news and updates, allowing you to tailor the action to the teams and sports you love, and from there make sure you never miss the latest goals, gossip or the start of Match of the Day. BBC iPlayer will remember and recommend programmes you love, update you so you never miss out, and let you seamlessly watch across devices. And myBBC will create a unique blueprint of your learning experience with the BBC over your lifetime. These are just some of the many exciting new features and benefits to our users that will be coming to BBC Online. We will only be able to deliver these services if we know who you are and what you are interested in. So we will invite you to register with us and sign in. By signing in, we will be able to find out about your interest, tastes, preferences and consumption patterns so that we can help you discover more content. We’ll learn from you and recommend things you may love, to bring you even greater value from the BBC and the licence fee. You can already sign in to the BBC online today, and for many of our online users, signing in to services such as Amazon, Netflix or eBay is a normal process. But for those for whom it’s new, we want to minimise any concerns you may have, and we will make it as easy as possible. One of the concerns we know many of you share is data privacy, and what data is being used for what purposes. We believe your data is yours. Wherever we collect and use your data, we will only use it to bring you the things that matter to you, surface hidden gems that you might not otherwise have found, and improve the BBC’s services. We’ll put you in control over how we use your data, and be open and transparent about what we’re using your data for. You will always be able to change or delete it. We will not do anything with your data that isn’t clearly explained, or that you don’t agree to. We will never sell your data, let other organisations track what you do with the BBC for their own purposes, or spam you. And we’ll guard and protect your data. The BBC is set up to serve the public, and to help everyone in the UK get the best out of digital technologies and the BBC. We have no reason to collect your data other than to serve you better. We have some big ideas and ambitions but want what we do to be shaped by you all. By better understanding your data, what you like and how you use the BBC, we’ll learn from you. Those insights will help make our programmes and services better for the future. We realise we are not the first to focus on creating personal experiences. We will learn from the experiences of others, and focus on building what we know will benefit our audiences from the start. The BBC has a unique blend of creative and technological expertise, and an unmatched breadth of content. We believe it’s that combination that will put us up there with the best of them. We can’t do everything we want all at once, and we want to learn from you as we go, focusing on the things that matter most to all of you. So you will start to see changes across the BBC online later this year as our new features and functionality start to go live. We’ll keep you updated as we go, and are excited about the possibilities. Unveiling our vision today is just the start.